SWEEPSTAKES IS ONLY OPEN TO LEGAL RESIDENTS OF THE FIFTY (50) UNITED STATES, THE DISTRICT OF COLUMBIA, UNITED STATES TERRITORIES (INCLUDING APO/FPO MILITARY ADDRESSES) AND PUERTO RICO. DO NOT ENTER THIS SWEEPSTAKES IF YOU ARE NOT PHYSICALLY LOCATED IN AND A LEGAL RESIDENT OF, ONE (1) OF THE FIFTY (50) UNITED STATES, THE DISTRICT OF COLUMBIA, UNITED STATES TERRITORIES (INCLUDING APO/FPO MILITARY ADDRESSES) OR PUERTO RICO. AN ENTRANT MUST BE EIGHTEEN YEARS (18) OF AGE OR OLDER, OR THE AGE OF MAJORITY IN HIS OR HER JURISDICTION OF RESIDENCE, WHICHEVER IS GREATER, AS OF THE DATE OF HIS OR HER PARTICIPATION AND ENTRY. EACH ENTRANT HEREBY REPRESENTS AND WARRANTS THAT SUCH ENTRANT HAS READ THESE OFFICIAL RULES AND AGREES TO THESE OFFICIAL RULES, WHICH ARE A CONTRACT (SO READ THEM CAREFULLY BEFORE ENTERING). THIS CONTRACT INCLUDES, WITHOUT LIMITATION, GRANTS OF RIGHTS AND INDEMNITIES TO THE SPONSOR FROM ENTRANT AND A LIMITATION OF ENTRANT’S RIGHTS AND REMEDIES. IF ENTRANT IS NOT AT LEAST EIGHTEEN (18) YEARS OF AGE OR OLDER, OR THE AGE OF MAJORITY IN HIS OR HER JURISDICTION OF RESIDENCE, WHICHEVER IS GREATER AND/OR IF ENTRANT DOES NOT AGREE TO THESE OFFICIAL RULES DO NOT ENTER THIS SWEEPSTAKES. Write A Review Sweepstakes (the “Sweepstakes”) is open only to legal residents of the fifty (50) United States, the District of Columbia, United States territories (including APO/FPO military addresses) and Puerto Rico (the “eligible geographic area”), who are physically located therein and who are at least eighteen (18) years of age or older, or the age of majority in their jurisdiction of residence, whichever is greater, as of the date of their participation and entry. This Sweepstakes and any web sites, web pages, and advertisements relating thereto are intended for viewing only within the eligible geographic area. Entries received from individuals residing outside the eligible geographic area, or where restricted or prohibited by law or individuals who are not legal residents of an eligible geographic area will be disqualified. Employees of The William Carter Company (the “Sponsor”), and its respective parents, affiliates, subsidiaries, distributors, sales representatives, and advertising agencies, and Administrator (defined below), and all other service agencies involved with the Sweepstakes, and members of their immediate family (spouse, parents, siblings and children) and household members (whether related or not) of each such employee are not eligible to participate or win. The Sweepstakes is subject to all applicable federal, state and local laws and regulations. By participating in this Sweepstakes and entering or attempting to enter into the Sweepstakes, Entrant agrees and acknowledges that: a) he or she has read and understands these Official Rules; b) he or she has met these Sweepstakes eligibility requirements; c) he or she unconditionally accepts and agrees to be bound by these Official Rules and the decisions of the Sponsor and Administrator, which are final and binding in all matters related to the Sweepstakes; d) he or she waives any right to claim ambiguity in this Sweepstakes or these Official Rules; and e) winning and receiving a prize in contingent upon compliance of these Official Rules and fulfilling all requirements. The Sponsor is The William Carter Company, 3438 Peachtree Road NE, Suite 1800, Atlanta, GA 30326. The Administrator is Universal Promotions, Inc., 3561 Valley Drive, Pittsburgh, PA 15234. The Administrator is an independent judging organization whose decisions as to the administration and operation of the Sweepstakes are final and binding in all matters related to the Sweepstakes. The Sweepstakes begins on 2/14/17 at 12:00 a.m. Eastern Time (“ET”), and ends on 12/31/17 at 11:59:59 p.m. ET (the “Sweepstakes Period”). The Sweepstakes Period is the overall timeframe of the Sweepstakes; within the Sweepstakes Period will be ten (10) Promotion Periods. Entries from Promotion Periods do not carry over into subsequent Promotion Periods. The Sponsor’s computer clock is the official time-keeping device in this Sweepstakes. No Purchase Necessary to Enter. There are three (3) Methods of Entry. In the event that for any reason whatsoever an Entrant’s entry, or any portion thereof, is not captured as a full submission in accordance with these Official Rules, whether through no fault of Entrant or otherwise, including but not limited to as a result of the effects of hackers or the failure of any electronic equipment, or human intervention, computer or cellular transmission, or network connections, any such attempted entry submissions will become null and void and Sponsor shall have no duty to advise Entrant, to allow Entrant to resubmit, or any liability for such failure in any respect; all of which Entrant hereby waives to the fullest extent permitted by applicable law. Specifically without limiting the generality of the foregoing, in addition Sponsor is not responsible for any lost, late, illegal, intercepted, incomplete, misdirected, damaged, destroyed, mutilated, unintelligible or not received entries, or for errors, omissions, interruptions, deletions, defects, delays in operations, in transmissions of entries. If an Entrant does not follow the instructions of an entry method listed below, Entrant’s entry will be viewed as not captured as a full submission, and all entries that are not captured as a full submission for any reason whatsoever will be disqualified from the Sweepstakes. Proof of sending an entry will not be deemed to be proof as a full submission entry nor will it be deemed proof of receipt by Sponsor. If Entrant is entering via a mobile phone or other web-enabled device and is using his or her wireless carrier’s network, Entrant may incur standard data charges from his or her wireless carrier and/or other charges may apply (such as normal airtime and carrier charges) and may appear on an Entrant’s mobile phone bill or be deducted from an Entrant’s prepaid account balance. An Entrant should contact his or her wireless carrier for more information on rate plans and charges relating to his or her participation in this Sweepstakes. To enter the Sweepstakes using the Carter’s Website Entry Method during the Sweepstakes Period an Entrant: a) must visit www.carters.com/Ratings-and-Reviews/ratings-and-reviews,default,pg.html?id=carters; b) search and click on a product; c) click on write review; d) log-in or create account; and e) follow the instructions to complete the form to write a review. Entrant will be required to accept Sponsor’s Terms and Conditions for writing a Review. To enter the Sweepstakes via the Telephone Entry Method during the Sweepstakes Period an Entrant: a) must call Toll-Free 1-877-642-5666; and b) must leave an intelligible message with the name of the Sweepstakes, his or her full name, address with street, city, state, postal code (P.O. Boxes are not permitted) and daytime phone number in English. Entrant should speak slowly and clearly when providing the above mentioned information. For potential prize winner notification an Entrant must provide a daytime phone number that is functional between the hours of 8:00 a.m. ET through 5:00 p.m. ET, until prize winners are selected and finalized. Sponsor is not obligated to leave a message on voice mail, answering machine or other communication device. There is a limit of one (1) review per product during the Sweepstakes Period. There is a limit of ten (10) entries Per Promotion Period. 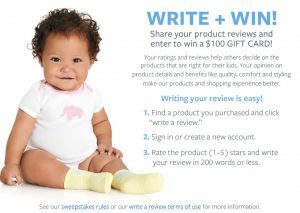 For greater certainty and the avoidance of any doubt, an Entrant who uses the Carter’s Website Review Entry Method or OshKosh B’Gosh Website Review Entry Method is permitted to write only one (1) review per product purchased. If it is discovered by the Sponsor (using any evidence or other information made available to or otherwise discovered by Sponsor) that any person has attempted to use multiple names or identities, to write a product review for the same product, or uses any automated, macro, script, robotic or other system(s) or program(s) to enter or otherwise participate in or disrupt this Sweepstakes; then he or she may be disqualified from the Sweepstakes in the sole and absolute discretion of the Sponsor. Any entry obtained outside of an authorized, legitimate channel and/or that is not in compliance with these Official Rules will void all such entries and disqualify any Entrant using such methods. The use of automated software or unauthorized computer programs to register for Sponsor’s Sweepstakes is prohibited. Sponsor reserves the right to disqualify any person found or suspected of, tampering with the entry process, or the operation of this Sweepstakes, or interferes with the proper entry of this Sweepstakes, or is acting in violation of these Official Rules, or is acting in a non-sportsmanlike or disruptive manner, or is acting with intent to annoy, abuse, threaten, or harass any other persons will be disqualified. WARNING: ANY ATTEMPT BY AN INDIVIDUAL, WHETHER OR NOT AN ENTRANT, TO DELIBERATELY DAMAGE, DESTROY, TAMPER WITH OR VANDALIZE THIS SWEEPSTAKES OR INTERFERE WITH THE OPERATION OF THE SWEEPSTAKES, IS A VIOLATION OF CRIMINAL AND CIVIL LAWS AND SPONSOR RESERVES THE RIGHT TO SEEK DAMAGES AND DILIGENTLY PURSUE ALL REMEDIES AGAINST ANY SUCH INDIVIDUAL TO THE FULLEST EXTENT PERMITTED BY LAW. Failure by the Sponsor or Administrator to enforce any provision of these Official Rules shall not constitute a waiver of that provision. Sponsor reserves the right to screen entries and in Sponsor’s sole discretion reserves the right, to disqualify and remove any entry it deems as inappropriate, unacceptable and/or fails to adhere to these Official Rules and/or Sponsor’s Write a Review Terms and Conditions. Sponsor is not obligated to notify Entrant of the actions to remove or disqualify Entrant’s entry. Entrant agrees if his or her entry is contested in any manner for any reason whatsoever, Sponsor may disqualify that entry and discontinue use without notification and Entrant agrees if Entrant’s entry is contested in any manner for any reason whatsoever not to contest the decision of Sponsor and that such decision shall be final. Entries posted on the Sponsor’s website or any medium selected by Sponsor, solely represent the views and opinions of the Entrants and do not reflect the views and opinions of Sponsor in any manner. Sponsor is acting as a passive conduit for the posting and publication of entries and has no obligation to and expressly disclaims any and all liability in conjunction with screening, monitoring or reviewing the content of an entry. Sponsor makes no claim they will edit entries submitted by Entrants prior to posting them on Sponsor’s website or any selected medium by Sponsor. Entrants are not permitted to use another person’s identity or another person’s email account, nor can an Entrant share the same email account to enter the Sweepstakes. If a person is found using another person’s identity or email account he or she will be disqualified and ineligible to claim any prize. In case of a dispute as to the identity of an Entrant via the Carter’s or OshKosh B’Gosh Website Entry Method, entry will be considered to have been made by the authorized account holder of the email account identified with the entry submission, regardless of the individual that submitted the entry. In the event of a dispute regarding entries received from multiple Entrants using or having the same email account, the authorized account holder of the email address at the time of entry submission will be deemed to be the Entrant. Sponsor reserves the right to deem that the entry was submitted by the authorized account holder of the email address. “Authorized Account Holder” is defined as the natural person who is assigned to an email address by an Internet access provider, online service provider, or any organization that is responsible for assigning email addresses or the domain associated with the submitted email address. Entries made via the Carters & OshKosh B’gosh Website Method cannot contain any material that would violate or infringe upon the rights of any third party, including copyrights, trademarks, or rights of privacy or publicity, other than writing about or uploading an image of Sponsor’s product. The entry cannot contain materials embodying the names, likeness, photographs, or other identifying elements of any person other than Entrant’s child or children, without written permission. of Winning will depend upon the number of eligible entries received. Sponsor will conduct one random drawing per Promotion Period (defined below), by combining entries from the Carter’s Entry Method, OshKosh B’Gosh Entry Method and Telephone Entry Method to select five (5) potential prize winners. In the event an Entrant wins a prize, and is later found to be in violation of these Official Rules, Entrant will be required to forfeit the prize or, if the violation is discovered after the prize winner has used or redeemed the prize, to reimburse Sponsor for the stated prize value listed in these Official Rules. Limit of one prize per person pre Promotion Period. See Chart below for number of prize winners and prize description per Promotion Period. The total prize value of all prizes being awarded per Promotion Period is five hundred dollars ($500). Prize winners must accept the prize being awarded or prize may be forfeited and may be awarded to alternate prize winner. Certain restrictions and terms and conditions may apply to prizes. Prizes are non-transferable in whole or in part except at the discretion of the Sponsor. No substitution or cash redemption except at the discretion of Sponsor, in which case a prize of equal or greater value will be awarded. Sponsor reserves the right, to substitute a prize (or component thereof) of equal or greater value for any reason whatsoever. Prize winners shall bear all risk of loss or damage to prize upon being awarded and Sponsor does not have any obligation or responsibility to replace prize if lost, damaged or stolen. Sponsor is not responsible for any fees, costs, or additional charges that may result from an Entrant and/or prize winner participating in the Sweepstakes or being awarded and receiving and using a prize. Prizes will be fulfilled within four (4) to six (6) weeks after each Promotion Period on or about drawing date. The Sponsor shall not assume any liability for a lost, damaged or misdirected prize. An unclaimed prize will not be awarded. Prize winners will be considered to be potential prize winners until Sponsor confirms his or her prize winner status. Entrant acknowledges and grants Sponsor the ability in its sole discretion to announce the names or any identifiable information of an Entrant/potential prize winner on its Website, or in any other form of public communication. Sponsor will email or call a potential prize winner. In Sponsor’s sole discretion, a selected entry of the potential prize winner will be disqualified from the Sweepstakes if a potential prize winner: a) is unreachable or unresponsive to notification or attempted notification; or b) declines or cannot accept, receive or use the prize or any component of the prize for any reason; or c) does not meet eligibility requirements; or d) has failed to comply with these Official Rules. If the potential prize winner is disqualified from the Sweepstakes for any reason whatsoever, he or she will be required to forfeit the prize without compensation of any kind. Sponsor reserves the right to modify the notification process. BY PARTICIPATING IN THIS SWEEPSTAKES ENTRANTS, PRIZE WINNERS, AGREE TO RELEASE, INDEMNIFY, DEFEND AND HOLD HARMLESS SPONSOR, ADMINISTRATOR, AND THEIR PARENT COMPANIES, SUBSIDIARIES, AFFILIATES, PARTNERS, REPRESENTATIVES, AGENTS, SUCCESSORS, ASSIGNS, EMPLOYEES, OFFICERS AND DIRECTORS (COLLECTIVELY, THE “RELEASED PARTIES”) FROM ANY AND ALL LIABILITY FOR ANY INJURIES (INCLUDING EMOTIONAL DISTRESS), FROM ANY AND ALL CAUSE OF ACTION, LIABILITIES, SUITS, CLAIMS INCLUDING BUT NOT LIMITED TO, THIRD PARTY CLAIMS THAT MAY BE MADE AGAINST ENTRANTS, AND CLAIMS ARISING OUT OF OR RELATING TO ACCEPTANCE, RECEIPT, POSSESSION OR USE/MISUSE OF ANY PRIZE, OR ANY PUBLICITY OR OTHER PUBLIC EXPOSURE OF ENTRANT, INCLUDING WITHOUT LIMITATION, CLAIMS CONCERNING INFRINGEMENT OR INVASION OF ENTRANT’S PRIVACY OR PUBLICITY RIGHTS, OR DEFAMATION, OR ACTS UNDERTAKEN IN PREPARATION FOR, OR PARTICIPATION IN, THE SWEEPSTAKES, AND LOSSES AND/OR DAMAGES OF ANY KIND TO PERSONS, INCLUDING DEATH, OR PROPERTY ARISING IN WHOLE OR IN PART, DIRECTLY OR INDIRECTLY, FROM ANY PRIZE OR RESULTING FROM AWARDING, ACCEPTANCE, NOTIFICATION, POSSESSION, USE, MISUSE, LOSS OR MISDIRECTION OF ANY PRIZE OR RESULTING FROM PARTICIPATING OR INABILITY TO PARTICIPATE IN THIS SWEEPSTAKES PROMOTION OR ANY SWEEPSTAKES PROMOTION OR PRIZE RELATED ACTIVITIES. ENTRANT ASSUMES LIABILITY FOR INJURIES CAUSED OR CLAIMED TO BE CAUSED BY PARTICIPATING IN THE SWEEPSTAKES, OR BY THE ACCEPTANCE, POSSESSION, USE OF, OR FAILURE TO RECEIVE ANY PRIZE. The Released Parties shall not have any obligation, responsibility or liability, including but not limited to any responsibility to provide compensation or award any prize to Entrants, with regard to: (1) Entries that are forged, falsified or altered or contain inaccurate information or do not comply with or violate these Official Rules; (2) Entries and/or notifications that are lost, late, incomplete, illegible, unintelligible, unrecorded, damaged, garbled, or misdirected, for errors, omissions, interruptions, deletions, defects or delays in operations or transmission of information, in each case whether arising by way of technical or other failures or malfunctions of computer hardware, software, communication devices or transmission lines or data corruption, theft, destruction, unauthorized access to, or alteration of, entry materials, loss or otherwise; (3) Electronic communications which are undeliverable as a result of any form of active or passive filtering of any kind, or insufficient space in an Entrant’s e-mail account to receive e-mail messages; failures or malfunctions of phones, phone lines or telephone or data transmission systems; interrupted or unavailable network, server or other connections; any error omission, interruption, defect or delay in any transmission or communication; traffic congestion on the Internet or any technical problem; (4) Any technical or human errors resulting in errors of printing of Sweepstakes offer, administration of Sweepstakes, potential prize winner Sweepstakes notification, announcement of Sweepstakes prize winners and/or prizes, or any errors of any kind that may result in the selection and notification of a prize winner; (5) Entrants who have committed fraud or deception in entering or participating in the Sweepstakes or claiming a prize; (6) Any inability of a prize winner to accept the prize in whole or in part for any reason whatsoever; (7) If a prize cannot be awarded to a prize winner due to delays or interruptions due to Acts of God, natural disasters, threats of or actual terrorism, weather, war, fire, labor dispute or strike, civil disturbance, riot, transportation interruption or any similar event or cause beyond the Released Parties reasonable control; (8) Human error, unauthorized human intervention, inaccurate or non-capture or mis-entry of any information and/or of an entry; and (9) Any Entrant, prize winner or any other person for damage to such person’s computer or its contents or mobile device. Entrant, prize winner acknowledge that he or she will release and hold harmless Released Parties from any liabilities, and for but not limited to any claims or causes of action based on publicity rights, defamation or invasion of privacy and the condition and features of a prize. Sponsor reserves the right to correct any errors pertaining to this Sweepstakes for any reason whatsoever. If for any reason whatsoever the Sweepstakes (in whole or in part) is not capable of running as planned due to but not limited to, computer virus, worm, bug, tampering, hacking, unauthorized intervention, fraud, technical difficulties or failures or any other causes which in the sole opinion of Sponsor, could corrupt or affect the administration, security, integrity, fairness, or proper conduct of this Sweepstakes, the discretion of only the Sponsor, reserves the right to cancel, modify, suspend or terminate the Sweepstakes and determine prize winners from entries already received or as otherwise deemed fair and equitable by Sponsor. Except where prohibited, by participating, Entrant, prize winners agree that all issues and questions concerning the construction, validity, interpretation, administration, and enforceability of the Official Rules, or the rights and obligations of an Entrant, prize winner and Sponsor shall be governed by and construed exclusively in accordance with the laws of the state of Georgia without giving effect to any principles of conflicts of law of any jurisdiction and that: (1) any and all disputes, claims, and causes of actions arising out of, or connected with the Sweepstakes, shall be resolved individually, without resort to any form of class action; (2) any and all claims, judgments and awards shall be limited to actual out-of-pocket costs incurred, including costs associated with participating, but in no event attorney’s fees; (3) under no circumstances will any Entrant, prize winner be permitted to obtain awards for and hereby waives all rights to claim punitive, incidental and consequential damages and any other damages, other than for actual out-of-pocket expenses, and any and all rights to have damages multiplied or otherwise increased. By entering the Sweepstakes, all participants agree to be subject to jurisdiction in the Federal and State court of Georgia and agree that all disputes relating in any way to this Sweepstakes must be resolved in the courts of Georgia. Entrants and prize winners agree not to raise the defense of forum non conveniens. To obtain the prize winner list, send a self-addressed, stamped envelope to: Universal Promotions, Inc., 3561 Valley Drive, Pittsburgh, PA 15234; Attn: Write a Review Sweepstakes Winners List. Requests must be received by May 15, 2017 and include the Promotion Period.